Bill Hader was barely late for our interview—30 seconds, maybe—but he apologized profusely anyway. When faced with a sarcastic reply (“Yeah, I’m super offended”), the 39-year-old actor looked mortally wounded. 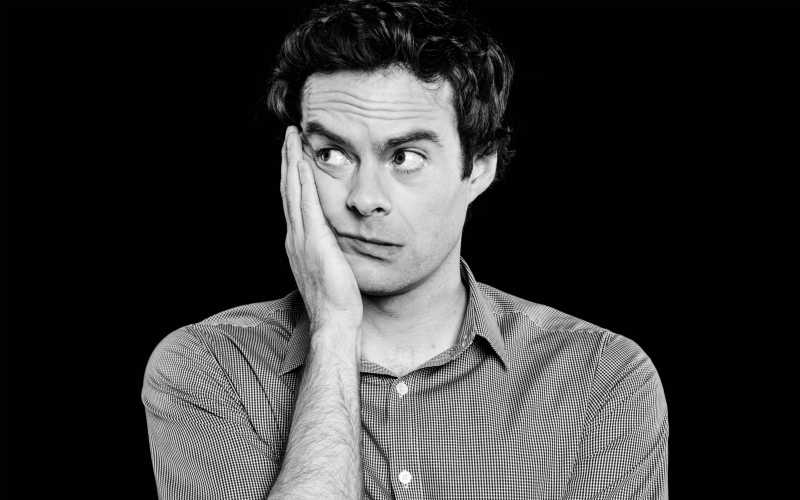 This is the Bill Hader you don’t see on TV: a film nerd from Oklahoma who is self-effacing to a degree most celebrities can only pretend to reach despite the fact that he earned an Emmy nom impersonating everyone from Herb Welch to Al Pacino on eight seasons of Saturday Night Live. That earnestness may be why the comic straight men he’s found himself playing of late—a suicidal Hollywood hopeful in The Skeleton Twins, an orthopedic surgeon in Trainwreck—suit him just as well as maniacs like SNL city correspondent Stefon or the weirdos he’s written and voiced for South Park. Hader taps into the trait again as the titular character in HBO’s Barry, a seriocomedy about a war vet turned hit man who’s trying to trade his career in murder for one in L.A. theater (Hader wrote the show alongside Alec Berg and makes his directorial debut on the first three episodes). But pelt him with bizarre questions over a cup of coffee, and it’s clear that his sense of humor can’t be quelled for long. You are a huge Star Wars fan. Would you rather fly in a plane with Harrison Ford or Han Solo? Well, Harrison Ford. No offense to Han. He’s a great guy, but there’s a massive difference between the two of them. True—Han Solo flies a spaceship, which is different than flying a plane. I’m going to say it’s harder than flying a plane. You don’t want Harrison Ford piloting your spaceship. Character from your career you’d impersonate on the Walk of Fame for the rest of your life? Probably Herb Welch, because he hit people with his microphone. I would be so frustrated from having to work there, but I’d get to take my aggression out on people. If you had made a movie when you were 21, what would the title have been? One L.A. story you and Fred Armisen could remake in the style of Documentary Now? There’s this L.A. movie called 8 Million Ways to Die that I would love to do a Documentary Now! about. It’s the most whacked-out movie. Hal Ashby directed it, and apparently it was taken away from him in the editing room. It feels like a movie that was shot one way and then edited another way. I’ve seen it like, five times. I can’t stop watching it. The performances are all over the place. You think Fred would be on board? Oh yeah, Fred’s always on board. There’s a Tumblr called Let’s Buy Bill Hader Some New Clothes. Item of clothing you’d never let anyone buy you? Anything. That Tumblr’s not wrong, by the way. I’m not a fashionable person. You once worked on Iron Chef America. Character from South Park you’d cast on the show? Chef would be the obvious one, but Chef died. So Cartman. The ingredient I’d give him is Scott Tenorman’s parents, and I’d put him up against Bobby Flay. Trey from “The Californians.” He’d be like, “Get ready for a tall drink of water, it’s going to be a good time!” in a surfer accent. Stefon and Seth Meyers were “married” on SNL. L.A. location where you’d renew your vows? In the La Brea Tar Pits. We would slowly sink until we were completely enveloped in tar, and then it’s just silent. That’s it? Are you guys dead? Who’s to say Stefon wasn’t already dead? He could’ve been dead the whole time—he’s just a ghost. You don’t even know who he is. I asked Seth Meyers this question, too. Oh, that’s good. But Seth sometimes applies too much logic to Stefon, because when John [Mulaney] and I write him, it’s just surreal insanity. Well, I have to ask, then: What’s L.A.’s hottest new club, according to Stefon? The hottest club in Los Angeles is Traffic. You don’t know it, but you’re in it. It’s a meta club. And Stefon will convince you that any time you’re in traffic, you’re in his club, so you have to pay him a fee. It doesn’t work, FYI.